The all female rock band out of London, Fake Club announce their new single ‘Beauty Queen’ and their Italian tour - for their first ever international shows. The single, available now via iTunes, shows off FAKE CLUB's deft ability to write massive pop-rock bangers every time; all killer, absolutely no filler. The 3rd track to be released from their upcoming full-length album 'Beauty Queen' stabs and gouges at the pretty set, the guys and girls who's hair sits perfect while they look down on the freaks, the geeks and the 'losers' who don't fit in. 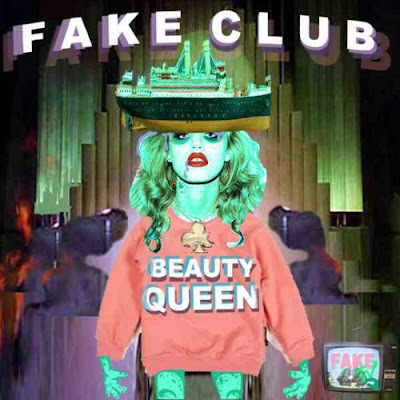 The video to ‘Beauty Queen’ will be out soon and includes drag queens, alcohol, a party on the boat and more - a real rock star lifestyle for this girl group. ‘Beauty Queen’ will be the third track the band have released and their first single proper; their upcoming Italian tour the first time they take their unique brand of 90s influenced rock abroad. ‘Beauty Queen’ is available now on iTunes. All upcoming tour dates can be seen below!